With Philadelphia not having a team in the new National Women’s Soccer League, we take a look at where the 2011 Philadelphia Independence players have landed. The Independence lost in the WPS Finals in 2010 and 2011, with head coach Paul Riley being named Coach of the Year in both of those seasons. Riley is not coaching in the new league after interviewing for the USWNT coaching vacancy last year. Players were signed to the NWSL through a variety of processes. National team players from Canada (16), Mexico (16), and the US (23) were allocated evenly amongst the eight teams. A Supplemental Draft was held on February 7. Each of the eight clubs submitted a list of 8-10 players to construct the list of players to be eligible for the draft. Domestic and international players were eligible for the Supplemental Draft but each team is allowed only two international players in addition to the international players that were allocated. There was then a Free Agency period and a College Draft to round out the teams. Vero Boquete (Sweden), Laura del Rio (England), Holmfridur Magnusdottir (Norway), and Sarah Hagen (Germany) are all playing internationally. Midfielder Lauren Cheney was strongly linked to the club before WPS folding but I do not believe she was ever officially signed. She was allocated to Kansas City. So where is the Philadelphia Independence? 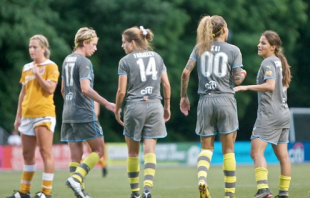 It breaks down to: FC Kansas City – 6, Boston Breakers – 3, Sky Blue FC – 4, Western New York – 2, Washington Spirit – 1, Seattle Reign – 2, Chicago Red Stars – 2, Portland Thorns – 0. Looks like you’ll be rooting for Kansas City if you are looking for the most former Philly players. Sinead Farrelly, Jen Buczkowski, and Tina diMartino made up three-fourths of the Independence’s starting midfield in the 2011 WPS Final as well. There have been few rumors of a new Philadelphia team and it does not seem that former Independence owner David Halstead is in a rush to bring professional women’s soccer back to the region. But as any reader of this site knows, Philadelphia has a strong soccer culture and can probably support a team as well almost any other city in the country. It’s also sensible geographically with DC, Sky Blue, Boston, and Western NY all being bus-able trips. We’ll keep an eye to 2014 or 2015 and hope to see women’s soccer back in the area. Thanks for posting this. Will get tickets to see most of their games at sky blue. Not excited over a KC team having a piece of the roster… so does every other team (except Portland). I feel more of an affinity to Boston’s group and I hope Kai has a good comeback for Maryland. We have seen all the Sky Blue games this year. Any word of a team coming back to Philly? Would be great to have one professional women’s team in this city!